Johnny Cash (born J. R. Cash; February 26, 1932 - September 12, 2003) wis an American sangster-sangwriter. He is ane o the maist weel-kent an maist influential muisickers o the 20t century. Johnny Cash wis born J.R. Cash in Kingsland, Arkansas, tae Ray an Carrie (née Rivers) Cash, an raised in Dyess, Arkansas. It is thocht that he wis gien the name J.R. acause his paurents coudna gree whit tae cry him, anely the initials. Houaniver, whan he jynt the Unitit States Air Force, they wadna accept J.R., so he chynged it tae John R. Cash. He wis ane o sieven bairns: Jack, Joanne Cash Yates, Louise Garrett, Reba Hancock, Roy, and Tommy. Bi the time he wis five, he wis awreadies wirkin in the cotton fields on his faimlies ferm. In 1944, Johnny's brither, wha he wis gey close tae, wis killt in an amshach in a mill whaur he wirkit. Cash aft spake o feelin guiltfu ower the incident, as Jack wis meant tae gae fishin wi Cash that day but insistit on gaun tae wirk, as the faimlie needit the siller. As a young lad, he leart guitar, an stairtit tae scrieve sangs. He wis influenced bi gospel muisic. In schuil, he e'en singit on the local radio station. Cash listit in the Unitit States Air Force, serrin as a morse code decoder on Roushie transmissions in Germany. Efter he wis honourably discharged in 1954, he gaed back tae Texas. Durin basic trainin he met Vivian Liberto, wha he mairit whan he gat back fae Germany in 1954. They haed fower dochters Rosanne (born May 24, 1955), Kathy (born April 16, 1956), Cindy (born July 29, 1958), and Tara (born August 24, 1961). Cash an Vivian flittit tae Memphis, Tennessee in 1954, whaur he stairtit a baun wi Luther Perkins an Marshall Grant. Thay decidit tae audition for Sam Phillips o Sun Records, but he wisna impressed wi thair gospel muisic, thiknin he coudna sell gospel onymair. Cash wan ower Phillips wi mair sangs that war mair kintra. His first sangs "Hey Porter" an "Cry Cry Cry" war met wi complowsible success. His neist sang, "Folsom Prison Blues", makkit the kintra muisic chairt Tap 5, an "I Walk The Line" becam a kintra muisic nummer 1 an made the pop chairts Tap 20. He lea'd Sun Records an jynt Columbia Records, an became ane o thair maist successfu airtists. In the early 60s, he tourt wi the Carter Familie, whaur he met June Carter, wha he wuid gae on tae mairy. In the early 60s, he stairtit drinkin a heap an becam addictit tae amphetamines an barbiturates. E'en tho his addiction war gaun oot on guidal, he still haed muisickal success, wi ane o his maist weel-kent sangs, "Ring of Fire", bein released durin this time.In 1965, his truck caucht fire, causin a forest fire that brunt hunders o acres o Los Padres Natinal Forest, California, killin 49 o the forests 53 endangert condors but Cash didna care, an the govrenment sued him for $82,001. Altho Cash haed an ootlaw eemage, he niver gaed tae preeson. Houaniver, he did spend a nicht in jyle on sieven occasions, for misdemeanours. His addiction tae drogs wis at it's warst at this pynt. Whilk led tae a divorce fae his wife. Houaniver in 1968, Cash quat uisin drogs, efter a spiritual epiphany in Nickajack Cove. He haed gaed intae the cove tae commit suicide unner the influence o drogs. He gaed deep intae the cove tryin tae tyne hissel, but he passt oot. Whan he woke up he chynged his mynd, an managed tae git oot o the cove bi follaein a faint licht an a breeze. The Carter faimlie muived him intae thair hame tae help him bate his addiction. He proponed tae June Carter onstage in London, Ontario, an thay gat mairit a week efter. He than rediskivert his Christian faith. In the late 60s, he stairtit tae perform in preesons. These led tae a couple o gey successfu albums "Johhny Cash at Folsom Prison" an "Johnny Cash at San Quentin". This included the single "A Boy Named Sue", a sang that raucht nummer 1 on the kintra chairts an nummer 2 on the pop chairts. He pleyed at a Swadish preeson an aw. Fae 1969 tae 1971 he haed his ain T.V. shaw, The Johnny Cash Show, wi guests like Bob Dylan, Ray Charles an Kris Kristofferson. By the early 70s, he wis weel-kent for performin aw in black, an wis kent as The Man in Black, e'en releasin a sang o the same name. He becam pals wi ilka Preses o the Unitit States, stairtin wi Richard Nixon, but he wis closest tae Jimmy Carter. His first autobiography, Man in Black, wis published in 1975 an selt 1.3 million copies. Durin the 80s he wis inductit intae the Kintra Muisic Haw o Fame, but didna hae muckle success wi his muisic. Hounaiver in the 90s he wis signed by American Recordings, a record label maist weel-kent for rap an rock. It wis wi thaim he recordit the album "American Recordings" in 1994. It wis a muckle hit, an wan a Grammy for Best Contemporar Folk Album. He gat a gey guid reception at Glastonbury Festival in 1994, whilk he said wis ane o the heichlichts o his career. He scrieved anither autobiography, Cash: The Autobiography, an aw. In 1997 he wis diagnosed wi Shy-Drager Syndrome. The albums American III: Solitary Man (2000) and American IV: The Man Comes Around (2002) conteened Cash's response tae his unweelness in the furm o sangs o a mair sombre tone nor the first twa American albums. Thay war ruised by critics an war gey faur-ben. His wife, June, dee'd on May 15, 2003, at the age o sieventy-ane. 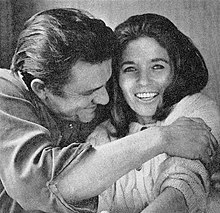 Johnny Cash dee'd less nor fower months after his wife, on September 12, 2003, while hospitalised at Baptist Hospital in Nashville, Tennessee. He wis birriet neist tae his wife in Hendersonville Memory Gardens naurhaund his hame in Hendersonville, Tennessee. Wikimedia Commons haes media relatit tae Johnny Cash. This page wis last eeditit on 13 Apryle 2017, at 00:37.